For three straight seasons, the New Orleans Saints have finished 7-9 and failed to reach the postseason. It’s become a troubling trend for an organization that reached the postseason five times between 2006 and 2013 and won the Super Bowl in 2009. But the Saints have retooled in the 2017 offseason, signing guard Larry Warford, linebacker A.J. Klein, wide receiver Ted Ginn Jr. and re-signing defensive tackle Nick Fairley, among other moves. The team also was involved in one of the biggest trades of the offseason, shipping Brandin Cooks and a fourth-round pick to the New England Patriots for first- and third-round selections. Will the changes spark a playoff berth for the Saints? Do Brees and head coach Sean Payton have another postseason run in them? Will the defense be improved after finishing 27th in yards allowed and 31st in points allowed in 2016? The Saints don’t have a particularly grueling schedule, with just six games against teams that reached the postseason last year. That being said, the slate of games they’ll face doesn’t exactly represent a cakewalk, either. Six matchups against their divisional rivals—the Atlanta Falcons, Tampa Bay Buccaneers and Carolina Panthers—won’t be easy. The Falcons, of course, are the defending NFC champions, while the Buccaneers came up just short in their bid to reach the postseason. The Panthers, meanwhile, should bounce back after a disappointing 2016. Facing the NFC North means matchups against playoff teams in the Green Bay Packers and Detroit Lions and a tough Minnesota Vikings squad. Facing the AFC East means difficult matchups against the New England Patriots and Miami Dolphins (in London). Add in a Washington team that nearly made the postseason and a road trip to face the Buffalo Bills, and the Saints don’t have many gimmes. There are contests in which they’ll be the clear favorites, however, including home games against the Chicago Bears and New York Jets and a road matchup against the Los Angeles Rams. The Saints don’t have an easy path back to the postseason, but they hardly have the league’s most difficult slate of games. No games will impact their season like the matchups against the NFC South. Last season, the team went just 2-4 in the division, a huge reason the Saints failed to reach the postseason. If they are going to end their playoff drought this year, improving in those contests will be vital. While the Saints split with the Panthers and Buccaneers, they went 0-2 against the Falcons. With Atlanta entrenched as the favorites in the division next year, the Saints need to steal at least one game against Matt Ryan, Julio Jones and Co. But the Bucs and Panthers both promise to be improved as well. Jameis Winston and Mike Evans lead Tampa’s talented offense, which also added speedster DeSean Jackson to the mix this offseason. The Bucs are one of the NFL‘s up-and-coming teams and have a division title on their minds. Carolina, meanwhile, slumped to a 6-10 mark last season after reaching the Super Bowl in the 2015 campaign. The team signed defensive end Julius Peppers, offensive tackle Matt Kalil and corner Captain Munnerlyn—moves the Panthers will hope reinvigorates a talented roster. Don’t expect an offense led by Cam Newton and a defense led by Luke Kuechly to play poorly two seasons in a row. 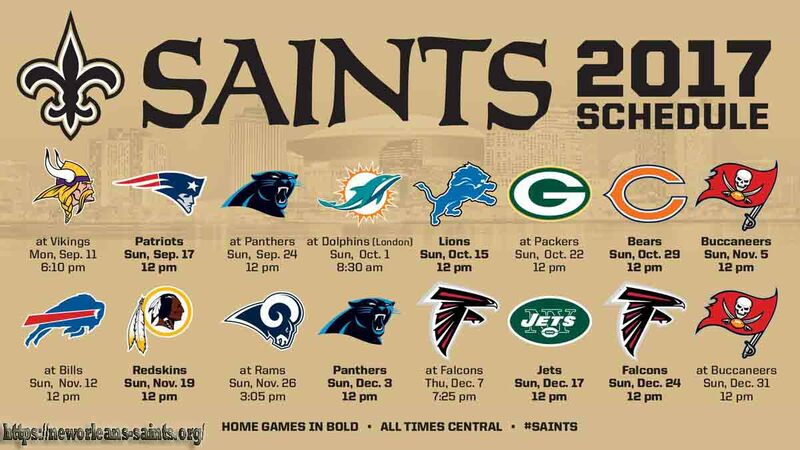 And don’t expect the Saints to make much noise next season if they can’t get the better of their divisional rivals. This entry was posted in New Orleans Saints Game and tagged New Orleans Saints on November 29, 2017 by spark.